This week the dishes of Ganzo’s Wednesday evening aperitivo were inspired by the recipes from Apicius, the oldest surviving collection of recipes. Apicius, named after Marcus Gavius Apicius and compiled around the 4th century AD, holds a collection of Roman recipes that follows Apicius’ value of using the finest ingredients to create the finest food. The cookbook paints a picture of what many Romans ate in ancient times, especially those of the wealthiest class, and differs greatly from what is commonly considered Italian cuisine today. 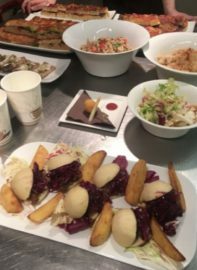 For the dishes, the students of Apicius International Students of Hospitality recreated some of the recipes from the famous cookbook. Because some of the ingredients used then are simply not available in this age, the students used common equivalents of those used in ancient times. A staple of Roman cuisine at the time was the cooks’ ability to camouflage flavors in a dish so that no single one stood out when eaten. The first dish, a salad with anchovy, bluefish and honey sauce, sautéed cabbage and squash utilized this technique of flavor camouflaging. No one flavor was the star of this dish, each flavor worked together to create a taste unique to any other food. The fish sauce also mimicked the taste of garum, a fish sauce used in many of the recipes in Apicius. The second dish was homemade sausage ground with spices and herbs to incorporate a wide variety of flavors, also utilizing flavor camouflaging. The third and final dish was a chicken liver mousse on sweet bread with an orange and rosemary garnish. The chicken liver mimicked a classic recipe for pate from Apicius. The sweet bread, also inspired by a classic recipe from Apicius, was made with honey rather than sugar as sugar was not available in ancient Roman times. Each dish was unique in flavor and incorporated some important ingredients of specific recipes from the Apicius cookbook as well as Apicius’ overall values as a connoisseur of exquisite food. This entry was posted on Friday, April 5th, 2019 at 9:38 am. It is filed under Tavolo 21. You can follow any responses to this entry through the RSS 2.0 feed.